You'll explore and learn at Alcazar de Segovia and Museo Nacional Thyssen-Bornemisza. Shop till you drop at Mercado San Miguel and Rio Creative Art Center. Get out of town with these interesting Madrid side-trips: Segovia (The Singular Olivia & Catedral de Segovia), Avila (The Walls of Avila, Cathedral of Avila, & more) and Toledo (Monastery of San Juan de los Reyes, El Transito Synagogue and Sephardic Museum, & more). And it doesn't end there: examine the collection at Prado National Museum, make a trip to Plaza Mayor, get a taste of the local shopping with Diseno Propio. Artesania., and steep yourself in history at Royal Palace of Madrid. To see photos, more things to do, ratings, and tourist information, you can read our Madrid holiday builder . Uberlandia, Brazil to Madrid is an approximately 15.5-hour flight. You can also do a combination of bus and flight. The time zone difference when traveling from Uberlandia to Madrid is 4 hours. While traveling from Uberlandia, expect a bit warmer days and about the same nights in Madrid, ranging from highs of 36°C to lows of 19°C. Finish up your sightseeing early on the 11th (Tue) so you can catch the train to Seville. Let the collections at Royal Alcázar of Seville and La Galeria Roja capture your imagination. Deepen your sense of the past at sights like Plaza de Espana and Seville Cathedral. Next up on the itinerary: wander the streets of Barrio Santa Cruz, steep yourself in history at Plaza de Toros de la Maestranza, view the masterpieces at Delimbo, and shop like a local with Un Gato en Bicicleta. To find photos, other places to visit, and more tourist information, you can read our Seville online day trip planner . Take a train from Madrid to Seville in 3 hours. Alternatively, you can fly; or drive. In June in Seville, expect temperatures between 35°C during the day and 20°C at night. Finish up your sightseeing early on the 14th (Fri) so you can travel to Barcelona. Give yourself a bit of retail therapy at La Boqueria and Villa del Arte Galleries. Your inner history buff will appreciate El Barri Gòtic and Casa Batllo. 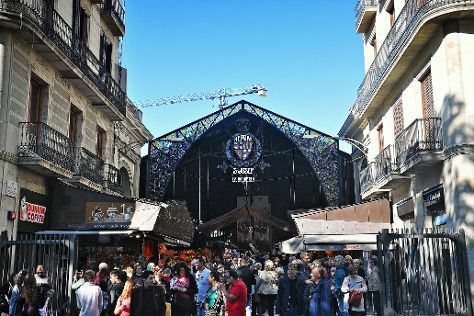 There's much more to do: admire the landmark architecture of Basilica of the Sagrada Familia, make a trip to Casa Mila - La Pedrera, examine the collection at Carrer del Mirador del Palau Nacional, and wander the streets of Passeig de Gracia. For photos, other places to visit, where to stay, and more tourist information, use the Barcelona vacation planner . Fly from Seville to Barcelona in 3.5 hours. Alternatively, you can take a train; or drive. While traveling from Seville, expect a bit cooler days and about the same nights in Barcelona, ranging from highs of 30°C to lows of 22°C. Wrap up your sightseeing by early afternoon on the 18th (Tue) to allow time for travel back home.